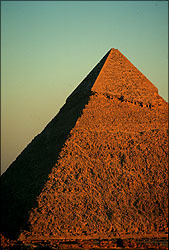 Khafre, who was the son of Khufu, was also known as Rakhaef or Chephren. He ruled from 2520 - 2494 B.C. and is responsible for the second largest pyramid complex at Giza, which includes the Sphinx, a Mortuary Temple, and a Valley Temple. The most distinctive feature of Khafre's Pyramid is the topmost layer of smooth stones that are the only remaining casing stones on a Giza Pyramid. Dates Built: c. 2558-2532 B.C. Angle of Incline: 53 degrees 7' 48"
Khafre may be best known for his statues, and most famous among them is, of course, the Sphinx. Mark Lehner and Zahi Hawass write of Khafre: "He was, after all, perhaps the greatest maker of statues of the Pyramid Age. There are emplacements in his pyramid temples for 58 statues, including four colossal sphinxes, each more than 26 feet long, two flanking each door of his Valley Temple; two colossal statues, possibly of baboons, in tall niches inside the entrances of the Valley Temple; 23 life-size statues of the pharaoh in the Valley Temple (fragments of several have been found with his name inscribed on them); at least seven large statues of him in the inner chambers of his Mortuary Temple; 12 colossal Khafre statues around the courtyard of his Mortuary Temple; and ten more huge statues in the Sphinx Temple."